So one would be forgiven for taking a back seat at the ceremony as soon as one's duties of walking the beautiful bride up the aisle are done - especially you've managed to avoid marching on her dress train all the way up! 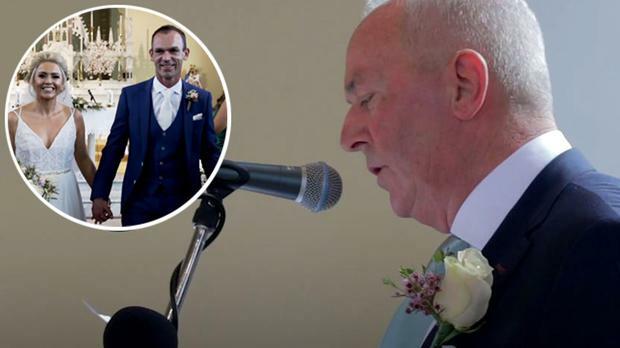 But one father of the bride, Leitrim man Gerry O'Connor, really stepped up to the job when his daughter asked if he would sing at her ceremony. "He's an amazing singer," Drumod bride Rachelle O'Connor tells THEVOW.ie, "and a lot of people didn't realise that he sang or that he was in the Annaduff choir. So I said to him 'would you do me a favour, would you sing at the ceremony?'" Gerry wasn't exactly keen on the idea at first, but after leaving it a few weeks to think, he eventually came around to the idea. "I said I'd never want to put him under any pressure of course," says Rachelle, who runs the Embodyment salon in Carrick-on-Shannon, "I wanted everyone to enjoy the occasion and look forward to it." "But I knew he was in capable hands with Andrew and Eimear, and he went up with them for a practise a few weeks before." The song - 'Your Wedding Day' by Limerick country singer Jimmy Buckley - was kept as a surprise for the day. Gerry sang the emotional tune after the communion, accompanied by pianist Andrew Reynolds, whose sister, former Roscommon Rose Eimear Reynolds, led the music at the church for the special ceremony which took place on Friday 28th September. "I love love, and I think that song just really captures it," Rachelle says, "There wasn't a dry eye. Everyone was wondering how I got through it without crying, but I knew if I started, I wouldn't have stopped!" Close friend and videographer Sheena Faughnan, who runs wedding videography company Críoative Films (crioativefilms.ie) was on hand to capture Gerry's beautiful tribute - and the rapturous reception for it. "It was a very special moment," says Sheena, who was not only the videographer for the day, but is also a close friend of the bride. "I could see the entire congregation from where I standing and you could see so many people eyes filling up with tears. The moment he finished singing is something I will never forget." The couple went on to celebrate with family and friends at Kilronan Castle, where they had traditional Irish music and sean nós dancing into the night. When you walk down the aisle with your husband, on your wedding day"